One of my fellow engineers recently shared this story and gave me permission to share with you. It speaks for itself. I had an experience this weekend which really made the idea of customer-specified value clear to me. I thought I'd share it with you. As some of you know, I recently discovered that the diamond in my engagement ring had a chip in it. So, my husband and I took it back to the point of purchase last week Sunday and we were informed that the stone would be replaced free of charge, no problem. Great! I couldn't wait to pick the ring up a week later (yesterday) and get on with it. I do, after all, wear it every day and well, I sort of missed it. So I go in yesterday to pick it up and I'm told to go back to the service area to retrieve the ring. I do this and the lady behind the counter very cordially greets me and goes off to retrieve my ring. 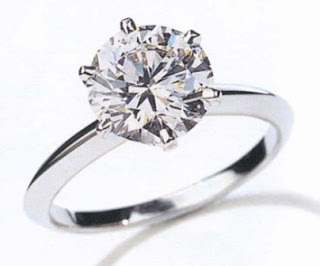 She returns and hands me my ring and I excitedly replace it on my finger. And then I notice that my ring looks nothing like it did before. The diamond used to sit up much higher and frankly looked a lot bigger. This ring that I now have on my finger looks much smaller and a lot less attractive. It looks like someone took a hammer to it and squashed it down. So, I told the woman this and she looked confused but then called the person who actually did the work. And he told me that "this setting is a lot more durable and less likely to wear". He added "You're going to like this a lot better." And the light went on. He incorrectly specified value rather than asking his customer to define it. The value of the ring, to me, is the aesthetic look of it. It is NOT its durability. When women talk about our diamonds we do not discuss their durability. We do not discuss how likely the ring is to wear and whether or not the ring will hold up during our next home improvement project. We talk about how sparkly they are and how large they are and how pretty they are. And since we are by and large the customers (directly or indirectly) of these rings, should they not be designed with our desires in mind? So now I enter phase 2 of my ring saga where I must decide whether to trust the store with a further modification of my ring or whether I take it to a jeweler in my home town who can do absolutely anything and will, I know, actually listen to me! Who decides “value”? The customer. Who delivers value? We do. How does this define waste? In terms of what the customer things value is. Circuitously, I ended up shopping for shampoo recently. Actually, I was shopping for a shampoo bottle, not shampoo. My wife had found a deal on shampoo but it came in a big batch, a huge bottle. I wanted to find a smaller bottle to put in the shower. As I wandered down the aisle, a fully clueless male clearly out of my element, I noticed some bottles were right side up, others upside down. I decided I’d like one of the upside down bottles…it would keep the shampoo closer to the opening…less “waste of waiting” you know. I reached for one bottle…oops, the label said “conditioner” not shampoo. I kept looking…and then it hit me. Sometime in the last decade, multiple manufacturers decided all shampoo would be in right side up bottles, while all conditioners would be in upside down bottles. BRILLIANT! A wonderful visual tool for a place when many people have impaired vision…no glasses, no contacts, not awake yet…the reasons are many. Which got me thinking…what a great way for simple A-B differentiation of tools, supplies and other needed items. Upside down, right side up. Add color to the mix and it is even more useful. I’m looking for opportunities.